Let’s make it clear from the start. 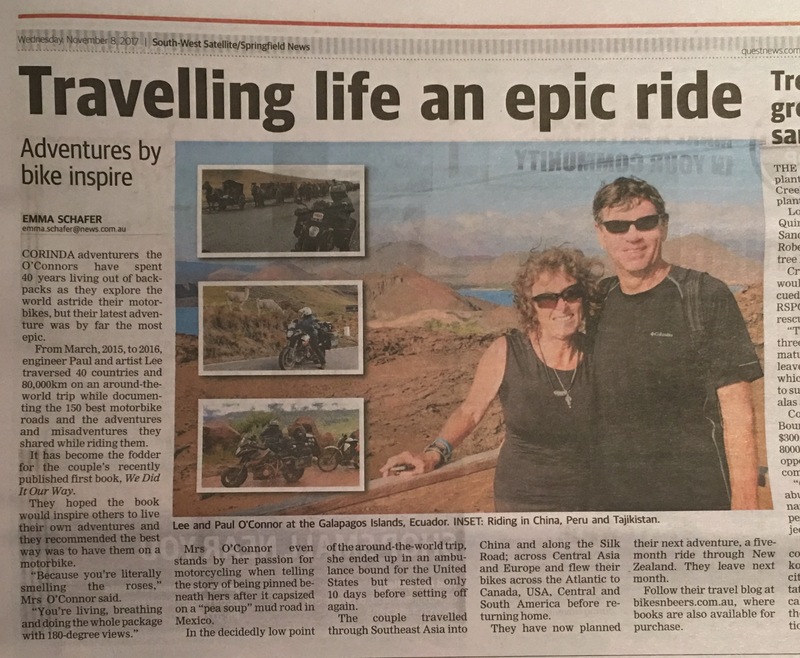 Lee and Paul O’Connor are not your stereotypical “bikies” they just happen to love the freedom of motorcycle riding, especially when it can be combined with a love of travel. “Motorcycle tragics” is how they describe themselves. Both learnt to ride as teenagers when “it was the poor man’s form of transport” and they were living in New Zealand. Then marriage and four children intervened until the recession we had to have in the early 1990s. We Did It Our Way – Bikes n Beers first book is available now! 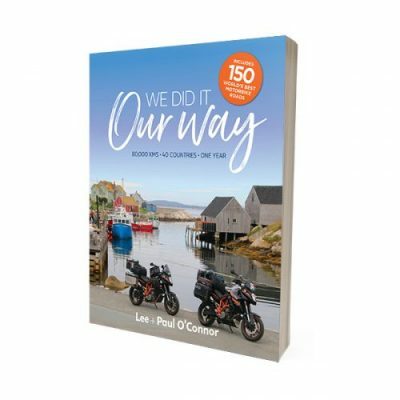 We Did It Our Way is an adventure travel book for aspiring and armchair explorers who love the road less travelled, and exotic foods and cultures. This is a visually stunning and highly entertaining travel book – but it is really about dreaming big, declaring your audacious goal to the world,and actually seeing it through. Avoiding most major cities as they travelled, this became more than just a ride. Encounters with amazing people, incredible scenery most travellers never see, food both delicious and questionable, serious accidents, and breakdowns in strange places make this a riveting yarn. And the beer! Let’s not forget about that. Paul and Lee’s colourful stories, incredible images and shared practical resources will pull you in totheir journey, and inspire you to dream, plan and take the next step towards the adventure of your lifetime. 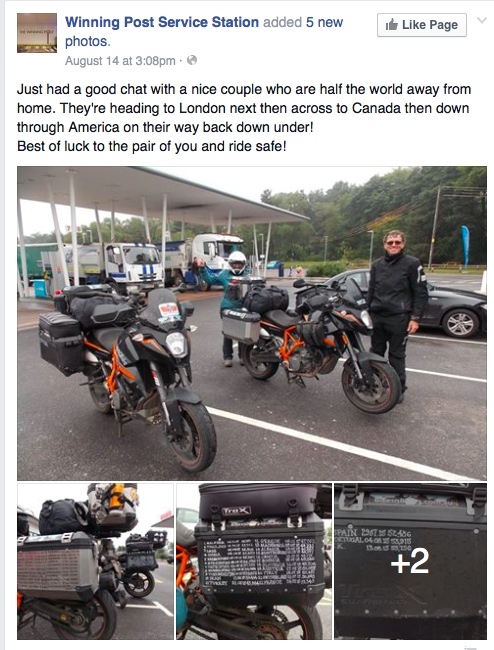 Lee and Paul O’Connor have ridden a variety of bikes since their teens and consider themselves motorcycle tragic’s. For over forty years the pair have found adventure in all corners of the world,continually planning for the next one. 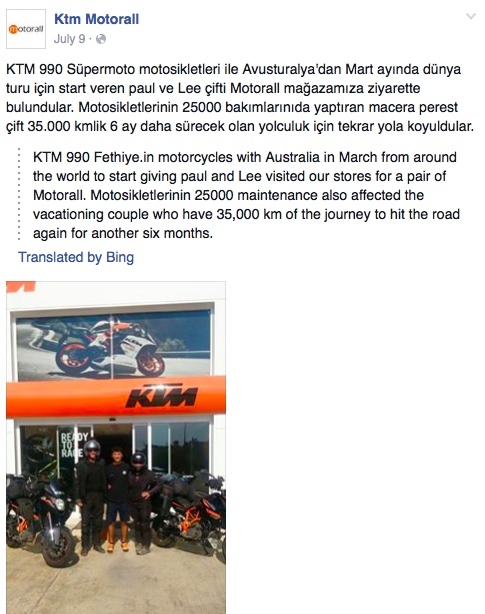 In March 2015, after meticulous planning, they flew their KTM 990 motorcycles to Kuala Lumpur andbegan an epic round-the-world adventure that would take them a year, riding 80,000 kilometres onspectacular roads through forty countries. Lee is an artist and Paul is a mining engineer. They have been together for 42 years and have four adult children. Australian motorcycle enthusiasts Paul and Lee O’Connor, left, stopped by the Guelph Arboretum as part of their around-the-world adventure last week. They were in town to visit with their neice Emma Heather, seen here with her guide dog Olivia and Paul’s sister, Emma’s mom, Raewyn. 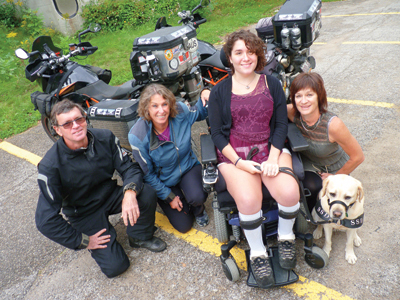 The couple is biking around the world and raising awareness about ataxia, the rare genetic condition Emma has lived with most of her life. Fredereich Ataxia is a debilitating, life shortening degenerative neuro-muscular disorder, which affects about 1 in 30,000 people in Australia and New Zealand. It is most commonly diagnosed between the ages of 5 and 18 years. We aim to raise awareness about FA as our niece Emma lives with this condition. Learn more about FA and read Emma's story here.